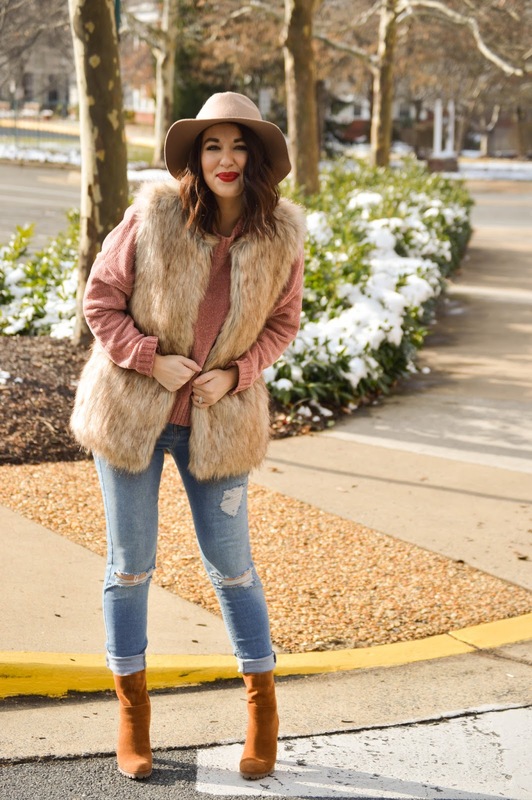 Rosy Outlook: Chenille & Fur + Fashion Frenzy Link-Up! Chenille & Fur + Fashion Frenzy Link-Up! Happy Wednesday loves! Hope you're having a great week so far. Mine has been pretty busy--there are some big changes to come in 2018 which I will share more about later this month! How are y'all doing with your holiday shopping? I honestly feel like I'm super behind. I have about half done! This chenille sweater is SO soft and I absolutely love the color. I have mixed feelings about chenille. sometimes I LOVE it and sometimes I feel like it looks a little cheap. This sweater is DEFINITELY a good one and it's also inexpensive considering the quality. I also have fallen back in love with this fur vest from Zara a couple years ago! Even though it's old, I linked to one almost identical from this year. Thanks so much for the feature Kelly! I am loving the fur paired with that pretty sweater! What a fantastic color on you! I love the jacket! It looks so pretty and comfy. This is the most perfect fur vest! I love it paired with the chenille and the colors go together so perfectly! That fur vest is so cute! I love how you styled it. Oh, you look so cute in this outfit! I love this vest and how you styled it! I am loving the chenille trend - it's so soft and comfortable! This sweater is such a pretty color and it looks great with the vest! This vest looks so cozy and warm! Great cold weather look! Hello cute n cozy girl! You look amazing and I adore that vest! I always love my faux fur vest, and this is exactly why---it looks so comfy and cozy!! I love the chenille and fur combination! So lush and cozy. This is the most perfect holiday look! That fur vest is the cutest and I love that chenille sweater! So cute girlfriend! I love this sweater and vest combo! So funny that I had it in today's post too. It looks so soft and good to know the quality is good! Happy Wednesday, Kelly! You are absolutely stunning in this outfit, I am obsessed with faux fur! Have a blessed holiday season! This is my kind of look! I love everything about it, and those boots are amazing! So many textures and I just love the chenille! The color of this sweater is so beautiful and I love it paired with the fur vest! You are always so cute and cozy!! And those boots? Pretty much AMAZING!! I have been living in chenille lately because it's so damn comfy! And I love this blush version on you, girlfriend! Loving that color sweater on you! I haven't got any chenille but I need to! Cute sweater dear, love it with the vest. Distressed denim brings in some nice touch too. Also, your lipstick is gorgeous!